I’m not the most flexible guy. I’m not known for going inverted or even playing much butterfly (my poor knees!). I have arthritic conditions due to an autoimmune disease, so I am always looking for ways to minimize my joint damage and improve my mobility and flexibility. Phillip has been a training partner of mine for the better part of 10 years. He has been studying multiple disciplines since I’ve known him. It’s his passion and how he makes his living. In addition to holding a Brown Belt in Brazilian Jiu-Jitsu and a Black Belt in Personal Defense Systems (PDS) under Mike Moses, Phillip has been devoting years of study to body mechanics, movement, strength training, muscle growth, gymnastics, dance, floreio, and many others. I’m over 230 lb, so flexibility and mobility has never been a strong attribute of mine. I approached Phil with the idea to show me a couple of moves that I could use to help my tightness before Jiu-Jitsu training. This nicely worked into a collaboration to write a companion article for our community here at HEAVYWEIGHTBJJ.COM. Without hesitation, Phil agreed. He and his wife Martina have assembled a fantastic online service and community around all things to improve human performance. Check them out at the Mindful Mover. As Brazilian Jiu-Jitsu (BJJ) practitioners, and even other grappling based arts, we all want to get better and stay far away from injuries. Getting better means improving our skills and learning new ones. We have to continue to learn new techniques while perfecting our old ones to improve our martial art abilities. We also want to stay injury free as this will let us stay on the mat and keep improving. This article is going to help you do that by helping you work on your mobility. Mobility is your ability to use your flexibility. So not only your ability to stretch, but how well you can get into it and use it. It’s makes a direct carryover to your BJJ practice and, if done right, can both improve your skills and keep you safe in case of accidents. Being able to bend and move well allow you to enter different types of attack and defense options. For a good example of this, you just need to look into a series like Eddie Bravo’s Rubber guard. If you look at the positions, it’s easy to see how proper flexibility and mobility training can help you learn a new series with more ease and open up new options to attack with. On the other hand, good mobility can also save you from injuries. How many times have we seen someone’s knee bend the wrong way on a takedown or a leg entanglement? How many of these accidents could have been prevented if the injured person had just a bit more mobility. Sometimes that mobility can be the difference between an escape and a tap. And sometimes it can be the difference between a tap and an injure that sidelines you for months. Like the phrase says, “A penny saved is a penny earn and an ounce of prevention is worth more than a gallon of the cure”. By preventing injuries in the first place, you get more time to train and improve which helps you reach your BJJ goals faster. Since most BJJ practitioners find their time is limited already due to spending time on the mats, we are going to work on two stretches that provide a lot of return on the time you invest in them. Those two are the internal rotation stretch and the pigeon stretch. The internal rotation stretch can be done seated on the ground as its easiest form, in a crab position as an intermediate, and squatting as an advanced variation. You’ll simply try to bring the knee from a vertical position the ground in front of you. This stretch opens up a range of motion that is often seen in Leg entanglements and various takedowns. Being able to enter this range safely will help prevent injuries when these positions do occur and the best part is it can be done anytime. Right before training or even while watching T.V are perfectly good times to do a set of twenty of these with a ten second hold on the last rep. These are great to help prevent knee injuries and make sure your knees and hips are safer on the mats while working takedowns and leg locks. The other stretch we have is a modified Pigeon Stretch from yoga. Maintain a flat back while doing this and keep your hands off the ground. This keeps the stretch on the hips and keeping your hands off the ground lets you build strength in that position. The strength built here is great for opening up new attack options like rubber guard. But it is also great for helping your hips stay mobile in cases like being stacked after a failed triangle or armbar attempt. Having this mobility before you end up in such a bad position can help you stay injury free when you end up in it. With these two stretches, you can easily increase your range of motion and surprise your training partners and opponents with some new attacks while staying on the mat and injury-free! Work your mobility and see how you gain new abilities and options in your BJJ practice! 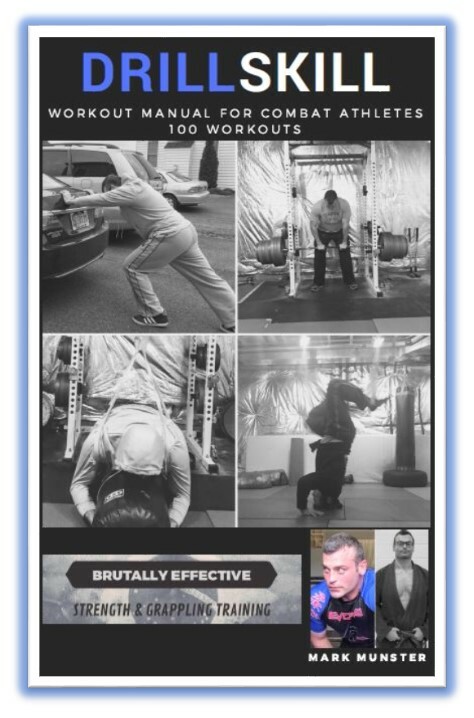 GET 100 GRAPPLING & STRENGTH BASED WORKOUTS!